~ Where do I leave my personalization info for my necklace? When you are checking out, you'll see a place for notes at the bottom of the page. That's your spot to leave your desired names or words to be stamped. If you complete checkout and have missed it, just email therustedchain@yahoo.com with your specifics. ~I'm local. Can I just come pick it up? Unfortunately, no. We process hundreds of local orders and can't arrange for customer pick up for them. If you'd like to email us we'll send you a "locals only" discount code to offset the shipping costs. ~ Can you stamp on the back of my necklace? Unfortunately no. Not unless it's specified in the listing. You can add another disc with the extra information though. ~ I placed my order and haven't heard anything. Did you receive it? If you received an email notification, then we received your order. We aren't able to reply to every one individually, unfortunately. But if you see a notice in your inbox, then we've got your order and will begin working on it soon! ~ Why stainless steel chain? We hear over and over from women that they love the strength of the chain. If a toddler grabs it and pulls, it won't break! Stainless steel is incredibly strong, a bit rustic looking, and keeps the prices down a bit. ~ What if I want a sterling silver chain instead of steel? You can grab one of those in the a la carte section of our shop. Perfect if you want a more delicate and shiny chain! ~ I want a different font. Can that be done? If you've seen the font somewhere else on our site that means we have it in stock. Just mention in the notes on paypal, that you'd like "typewriter" or "italic", etc. and we'll make it that way. If it won't fit properly, we'll choose a font that does fit. ~ I've had my necklace for a while and it's looking a bit worn. How can I clean it up? ~ What is your shipping time? Generally about 14 days or less. It may be slightly longer during peak shopping seasons. ~ Do you do this by yourself? Nope. I have a small team of helpers who are wonderful and keep things running smoothly. ~ I want something that isn't shown. Can you make it for me? You bet! Contact us and we'll see what we can come up with. ~ Do you wholesale or offer bulk discounts? We do. 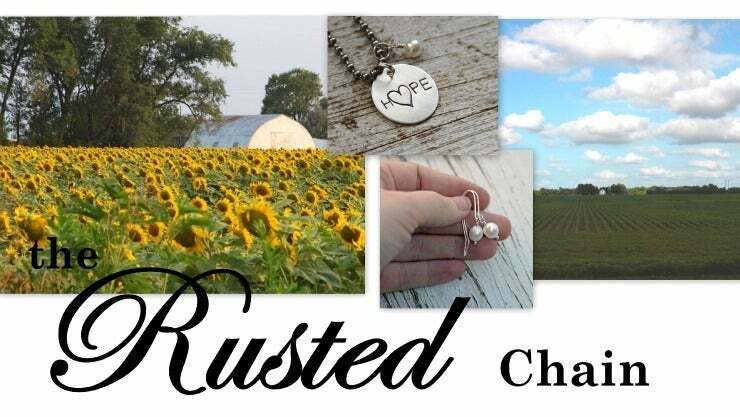 The Rusted Chain jewelry is sold in several boutiques across the country. If you're interested, please just contact us. ~ I received my necklace but the letters don't line up perfectly. Is that normal? Congratulations! Your necklace is completely unique and no one else in the world will have one identical to it. We don't have an engraving machine, but actually place each letter by hand. There will always be slight variations due to the handmade nature of our jewelry. We do our best to line things up perfectly, but if something is slightly off, embrace it for the charm it presents! ~ Do you do refunds? If we've made a mistake on the order such as misspelling a word, we will replace the item. If you're just unhappy with your item, and it's a custom made piece, we cannot issue a refund. ~ I'm purchasing several items. Will they each come in a gift box? Generally on multiple purchase orders, only one jewelry box is used. The first item will come in a gift box, and we'll include pretty organza bags for each additional item. ~ Do you ever offer discounts? Yes! Find us on Facebook, Twitter, and our blog to find surprise sales being offered. ~ How tall are you? I mean like, without shoes. Are you naturally blonde? How many toes to you have? Ha! Silly questions from the Facebook Fan page. 5'4". Yes. 10.